The goal of the NSF 342 training course is to get everyone “speaking the same language.” With the NSF 342 Sustainability Standard out in the marketplace, customers are asking some difficult questions that many sales representatives do not know the answers to. When a sales representative struggles to correctly handle customers’ questions regarding the standard, it makes the entire product category look bad. To create a confident sales team speaking the same language out in the marketplace, this is the training course your company needs. The following training course is designed to educate your company’s sales team on the NSF/ANSI 342 Sustainability Standard. This course is one hour in length and has a 15 question multiple choice exam at the end that each participant must complete. This course is accessible through the online tool DigitalChalk for $5.25 (per individual). The DigitalChalk tool is easy-to-use for registrants, letting them save as they go. The tool also allows your company the availability to monitor your sales team by tracking their progress through the course and to view how they have tested on the subject matter presented. 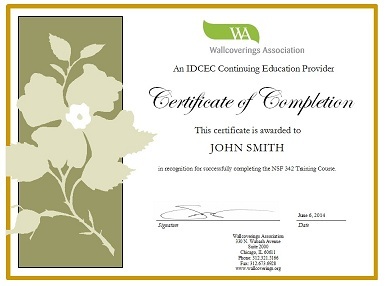 Individuals who complete the course will receive a certificate of completion at the end. 1. Determine who you'd like to take the course. Each company can sign up as many employees as they would like for the training course. The registration fee per individual is $5.25. 2. Complete and submit the registration form. Fill out the contact form for each individual you would like to participate in the course. Once you fill out the contact form for the first individual, you may click on "continue shopping" to register another individual. Click on "continue shopping" after each individual until you have registered everyone you'd like to participate. Once you have entered everyone, click on "check out" and the system will generate an invoice. Please note: each individual registered to participate must include a unique email address. Once you have completed the registration process, WA Headquarters will send participant(s) a personalized email (within 2-3 business days) including a url, username and password they will need to use to access the training tool. 3. Contact WA Headquarters if you are interested in tracking your sales team's progress throughout the course.